The WECO Backwashing filter with calcite is a Point-Of-Entry (POE) pH-control system for municipal and well water supplies. Calcite is natural crystalline calcium carbonate. It is the main mineral component in limestone, chalk, and marble. For acidic water treatment, calcite is crushed and screened to create a loose media suitable for use in a backwash filter. The hard composition and irregular granular shape of the calcite particles provides an extensive surface area that reacts with the acidic water. Acids are neutralized by reacting with the carbonates in calcite. Calcite self-limits the pH increase, only raising the pH enough to overcome acidity. The granular calcite also traps suspended solids in the media bed and reduces turbidity. The calcite neutralization process adds some calcium hardness to the water. Therefore, calcite neutralization treatment should be applied ahead of water softening. Calcite will also reduce some ferric and ferrous iron in the water supply. Acidic water causes problems with manufacturing processes, commercial food preparation, beverage formulation and leaching of lead and heavy metals like copper from pipes. For homeowners, building managers and health institutions, acid water causes blue and green staining in sinks, toilets and bathtubs due to copper leaching. Iron pipes will react with acid water and cause red stains. The metals also give the water a metallic taste. Residential and commercial laundries can experience fabric staining and customer complaints from acidic water. Corrosion of plastic PVC plumbing components is also possible resulting in the release of harmful amounts of vinyl chloride into drinking water. Acidic water also causes leaks in plumbing by slowly dissolving the inside of the pipes and fittings. Several sizes of this filter are available. 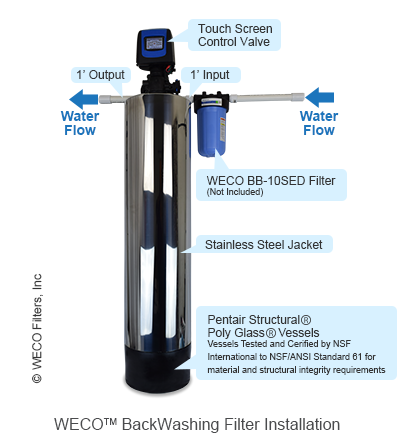 Please consult with WECO Technical Support for assistance in selecting the proper size filter to meet your water purification requirements. Water enters the top of the tank through the Fleck control valve and passes downward through the calcite filter media, which removes impurities. The WECO backwashing filter will clean itself periodically by rinsing away impurities it has filtered from water. When the calcite filter medium neutralizes acids, it slowly gets smaller. The control valve automatically starts the backwash process, rinsing away fines and collected particulate matter. The backwash procedure is an operation where water passes backward through the filter media at a fast flow rate. It enters the tank at the bottom through the riser tube, then flows upward through the filter medium, exiting at the control valve and sent to waste. The rapid, turbulent upward waterflow, in addition to flushing away particulate matter, loosens and resettles the media bed, preparing it for another filtration cycle. The treated and conditioned water enters the riser tube at the bottom of the mineral tank, passing upward and exiting the filter through the control valve.